Choice Privileges has today emailed out targeted offers for nights consumed between December 11 – February 9, 2018. 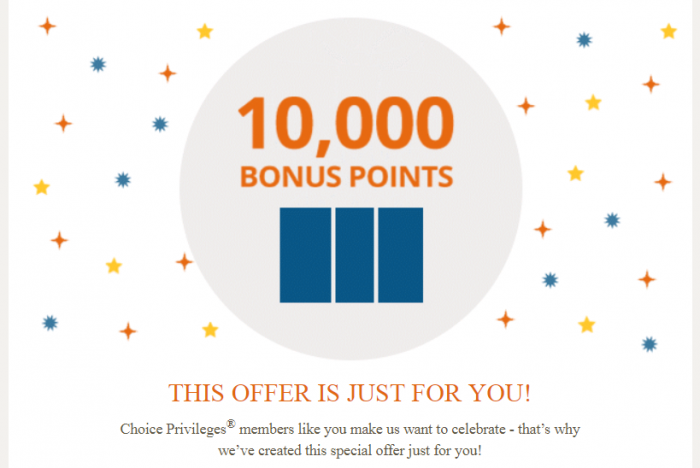 A LoyaltyLobby reader forwarded me an offer for 10,000 bonus points that requires five nights during the promo period. Interesting to see if this is the Choice Privileges promotion for the winter months (in the Northern Hemisphere). Although they claim that this offer is targeted, it does allow members to register (at least I was). Registration required by 02/09/18. Available only to current Choice Privileges members. Number of nights required to earn bonus points varies by member based on member’s individual stay history and other known data. Member must complete the required number of nights between 12/11/17 and 02/09/18 to earn their one-time bonus points. Only one room reservation per member per night will count towards the promotion. Nights booked must be at qualifying rates. Nights booked with the SEGEN and SRTLG rate codes or booked at vacation rental properties do not qualify. Stays in which Choice Privileges points are not earned; rooms booked for less than $40 per night; complimentary rooms; rooms paid for as part of a convention or meeting; rooms booked through a travel agent or third party online retailer as part of pre-paid wholesale rates; wholesale packages; and senior tours are also not eligible for this promotion. Choice Privileges member number must be provided upon check-in. To be eligible to earn the bonus, members must set their earning preference to Choice Privileges points in their online account. Any change made to earning preference will remain in effect after the promotion has ended. Members who complete their required nights will earn their bonus one time, regardless of total number of nights above their requirement completed during the promotion period. Points will be posted by 03/01/18. Available to US residents only. Valid for the intended recipient of the promotional email only and non-transferrable. For Choice Privileges program details, eligible rates, eligible countries and point redemption rules, visit www.choiceprivileges.com. Hotels are independently owned and operated. Next articleReader Question: SAS Plus – What Is Complimentary From The Menu?